When clicking “More details”, it shows “Operation failed with the error 0x000003eb”. 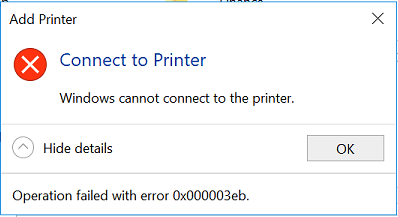 There problem continues to happen even though you have deleted and removed any existing printers, and ensure that all the printer ports are deleted. However, when the printer is connected to the computer via USB cable or connect directly via IP address, the printer can be added properly and works fine. Delete the problematic from “Devices and Printers” or “Printers & scanners” (in Windows 10) so that it’s removed from the system. Run Print Management (PrintManagement.msc), which also accessible from Control Panel -> Administrative Tools -> Print Management. Expand Print Servers and then your computer name. 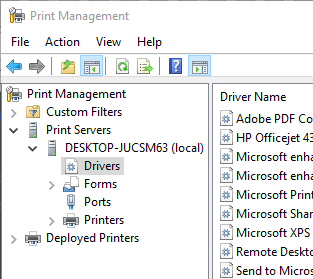 Go to Drivers, and delete the printer drivers which are linked to the problematic printer, faulty printer or non-existent printer, or residue drivers from previous install. For printer which is a network printer, go to Ports and delete any ports that are used by or linked to the problematic printer, faulty printer or non-existent printer, or port made by previous failed install. DO NOT DELETE ALL THE PORTS. Open Services (Services.msc), which also accessible from Control Panel -> Administrative Tools -> Services. Stop the Print Spooler service. After backing up, delete all the sub-keys and their values under Version-3. Rename the 3 folder to another name, e.g. “old3” and etc.